Heat oven to 350 degrees F. Spray 13x9-inch (3-quart) and 8-inch square (2-quart) baking dishes with cooking spray. In 12-inch skillet, heat oil over medium-high heat. Add chicken and onion; cook and stir 4 to 5 minutes or until chicken is no longer pink in center. Stir in cumin, garlic salt and oregano. Cook 1 minute longer; drain if necessary. Pour chicken mixture into large bowl. Reserve 2 tablespoons sour cream in small bowl; refrigerate. Into bowl of chicken mixture, stir remaining sour cream, roasted peppers, chiles and 1 1/2 cups of the cheese. Spread heaping 3/4 cup chicken mixture on center of each tortilla. Roll up tortillas; arrange 8 seam-side down in 13x9-inch baking dish and 4 seam-side down in 8-inch baking dish. Top each baking dish evenly with enchilada sauce. Sprinkle with remaining 1 1/2 cups cheese. Spray 2 sheets of foil with cooking spray; cover each baking dish with foil, sprayed side down. Bake about 50 minutes or until enchiladas are hot. 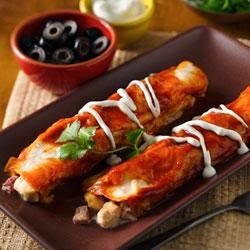 Use reserved 2 tablespoons sour cream to drizzle over enchiladas.